Millie Bobby Brown Performs Cardi B’s ‘Girls Like You’ Verse at Maroon 5 Concert in Nashville – Watch! Millie Bobby Brown just gave the crowd a big surprise! The 14-year-old Stranger Things star made an appearance onstage at the Maroon 5 concert on Sunday night (September 23) at the Bridgestone Arena in Nashville, Tenn. While on stage, Millie performed Cardi B‘s verse from their smash hit collaboration, “Girls Like You.” So good! Millie recently clapped back at the critics in defense of her friendship with Drake. Check out what she said. Watch her perform “Girls Like You” below! #MillieBobbyBrown surprises the crowd at the #Maroon5 concert in Nashville to perform the #CardiB verse in #GirlsLikeYou! So good! 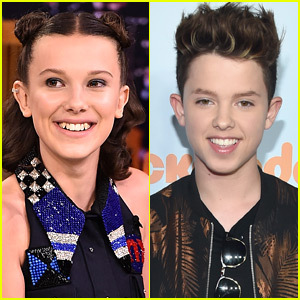 Millie Bobby Brown Supports Boyfriend Jacob Sartorius at His Concert! Millie Bobby Brown is head over heels for her new boyfriend Jacob Sartorius! The 13-year-old Stranger Things star was spotted backstage at the 15-year-old singer’s concert on Wednesday night (January 31) in Atlanta, Georgia. In the video and photos obtained by TMZ, Millie was seen hiding behind a curtain with a huge smile on her face while Jacob totally rocked out on stage. A few weeks ago, Millie took to her Instagram story to share an adorable shot of herself cuddling up to Jacob with tons of heart emojis. Want to know more about Jacob? We have a great interview with him at RawPages.com!